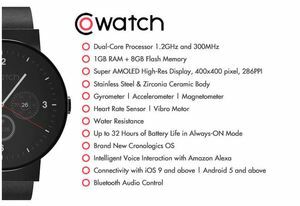 A Chinese company is about to release a new smartwatch which is integrated with Alexa from Amazon (Echo) called “CoWatch”. Here are the details published from their Indigo crowd funding page. Speak, and CoWatch will listen. With a built in dynamic speaker – and as the first smartwatch to integrate Alexa, Amazon’s cloud-based voice service, you can ask for a traffic report, control connected devices, make a phone call to a friend, order a taxi to your home, pay your bills, and so much more. 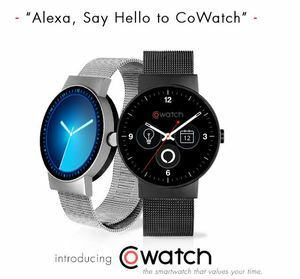 As long as your CoWatch is connected to a WiFI network or to your phone with a data connection, Alexa will be on! Your smart home is at your fingertips. The power of Bluetooth 4.1 and cloud connectivity lets you dim the lights, check on your car, turn up the heat, and interact with the devices, products, and services that matter to you most. Friends encourage friends to stay healthy. Be proactive and let CoWatch sweat the small stuff. 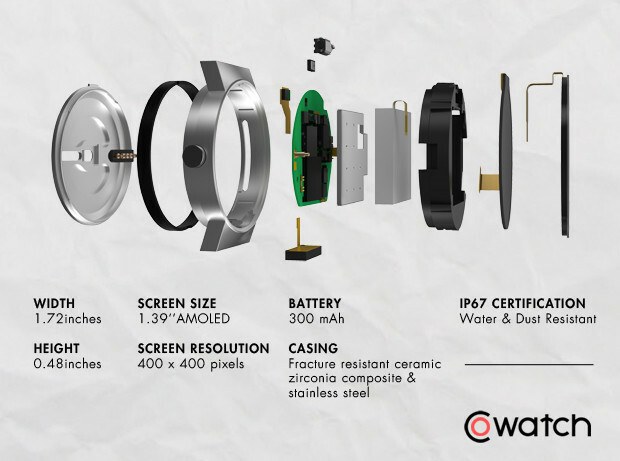 CoWatch can track your calories burned, count your steps, even monitor your heart rate after and during a workout. Using a nine-axis accelerometer, digital compass and gyroscope, as well as heart rate sensor and vibro motor, CoWatch can help you keep track of every move. Maximize efficiency and connect with a simple touch. Send a quick response through text message, check your emails, review your calls on your phone, connect to your favourite streaming service, and turn on your favorite song – CoWatch can do it all. 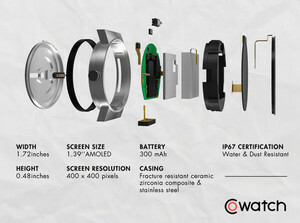 CoWatch unites classic watch design with state of the art technology. Elegantly constructed and at a price point that competes with other luxury brands, you have a choice between carbon black or mineral silver stainless steel, with a fracture-resistant zirconia composite ceramic body for excellent wireless signal (2.4G 802.11 b/g/n). The vivid super AMOLED 400 x 400 high-resolution touch screen has an interchangeable and reactive watch face, catering to your mood, experience, and look, from day to night. This is definitely a new concept given that Siri from Apple and Google NOW are already in smartwatches. The question is how useful or beneficial this concept will be. Reading their funding campaign made me excited about their product as this really sounds very interesting and then I started thinking about my personal application of that product. From a personal perspective I bought the Gear 1 years ago and I was able to control my home with Google NOW until Samsung decided to kick Android OS out and replace it with their own OS called Tizen. That integration stopped working after the change of OS but other options became available e.g. IFTT, etc. The point was to be able to have your home automation at your fingertips and/or use voice with your watch to control your home. Now, let’s look at CoWatch with this in mind. You can use CoWatch to get Alexa functionality at your wrist. I already have 2 Alexa’s in my home and I can use my voice to control my complete home. There are some rooms where using Alexa via the watch might be useful e.g. the Garage, Laundry room, etc but personally I don’t see the benefit of having an Alexa on my wrist while being at home as I can simply speak louder and Alexa will pick it up anyways. Alexa’s voice recognition range is simply awesome. This might be different if you would only have one Alexa for your whole home and you want to control your home from every single room at any point in time. The other use case would be to be able to control your home while on the road but in that case you already have your smart phone with your favorite home automation application and if you went all the way, you already have voice control on your phone for your smart home like Tasker + AutoVera or the Siri Integration with Vera. At home your cell phone might not be next to you so your watch voice control might become handy but again Alexa has a large voice recognition range already. Not being at home you have your cell phone most likely on you and with the Siri or Google NOW integration you already control your home via voice. Let’s see how their product will get accepted in the market especially with Alexa’s unprecedented growth and given that Amazon has published APIs for integration other smartwatch vendors might follow. Disclaimer: This blog and tweets represent my own view points and not of my employer, Amazon Web Services.